HVAC stands for Heating, Ventilation and Air Conditioning. These are integral systems in any modern household and they are usually best installed during the initial construction of your home so careful planning is important. Routing ductwork and setting up systems like a furnace or heat pump are easier to do when the building has no finished ceilings or drywall. ACTS Construction Group LLC is a full service general contractor serving Seattle and the surrounding area. We specialize in the installation of HVAC and home heating systems into new residential and small commercial construction projects throughout Seattle. We’ll design and install your duct work for maximum efficiency and airflow according to your specific needs and the size of your structure. When designing an HVAC system for a home in the Pacific Northwest maximum efficiency is often of the highest importance. High efficiency in an HVAC system starts with an excellent design to begin with and careful planning of your ductwork and the systems that will move air through them. Furnaces, heat pumps, boilers and air conditioners are all systems that must be matched to the size of your home and the climate they’ll be working in. It’s best to set an appointment with one of our HVAC experts if you’d like to have an accurate estimate for the installation in your new construction project. 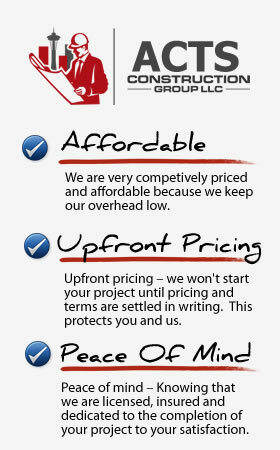 Why Choose ACTS Construction Group LLC For Your HVAC Installation in Seattle? When you choose to work the ACTS Construction Group LLC you are partnering with a team of construction professionals who have many years of experience designing and installing HVAC systems throughout the Seattle area. You can be sure that your home will have an HVAC system that provides great comfort and efficiency. If you’d like to receive an estimate for your HVAC system installation in an upcoming construction project please give us a call 206-503-6200 or fill out our contact form and someone will be getting right back to you.